An Online invoicing software that helps you to generate invoice and get paid faster - everything on a go. 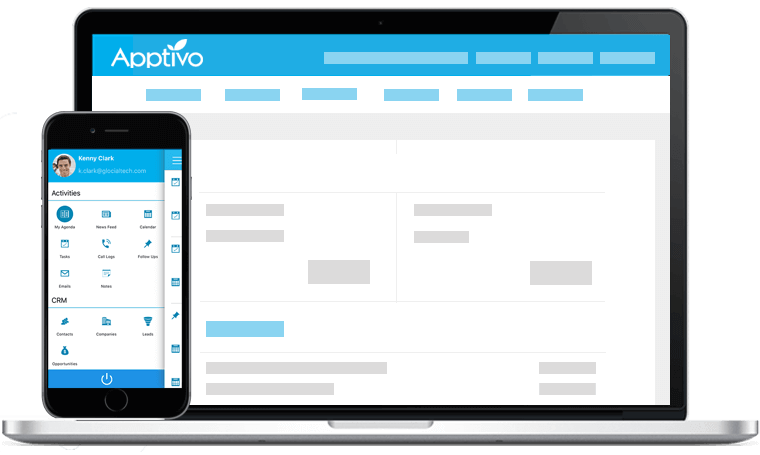 Apptivo Invoices serve you to create and send proficient invoices in a minute that help you get paid faster. 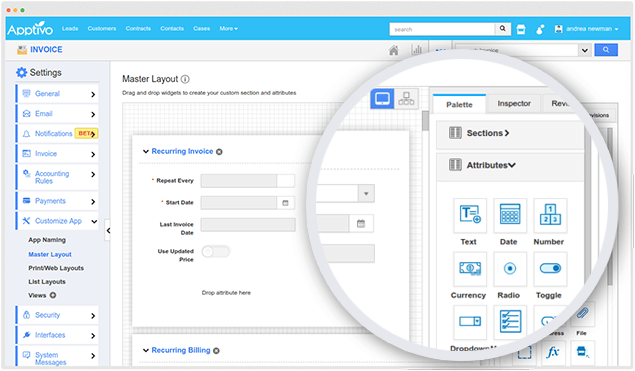 Customize invoices from an variety of templates with your logo and hues to make them perfect. 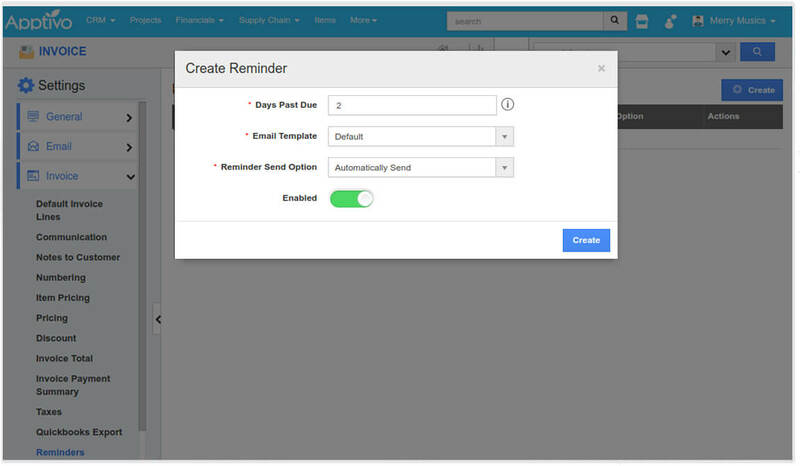 See overdue invoices initially and send reminders to your exceptional records. 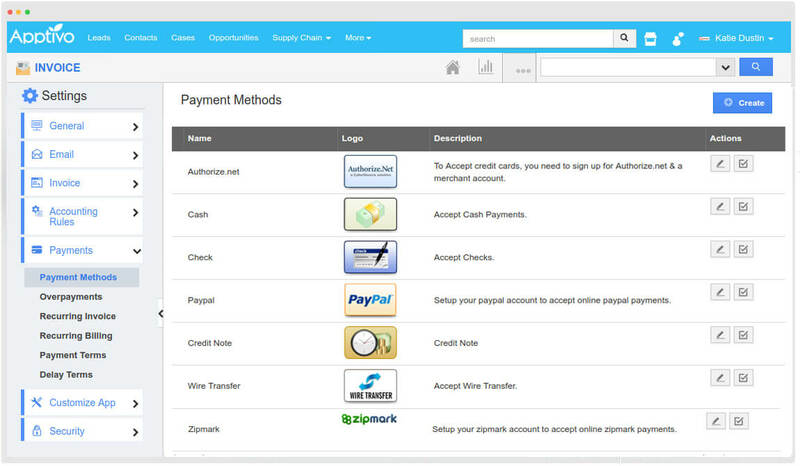 Set up payment gateways through various online payment portal. Get paid faster and easier by utilizing it in Apptivo. Create reliable recurring income with subscription billing. 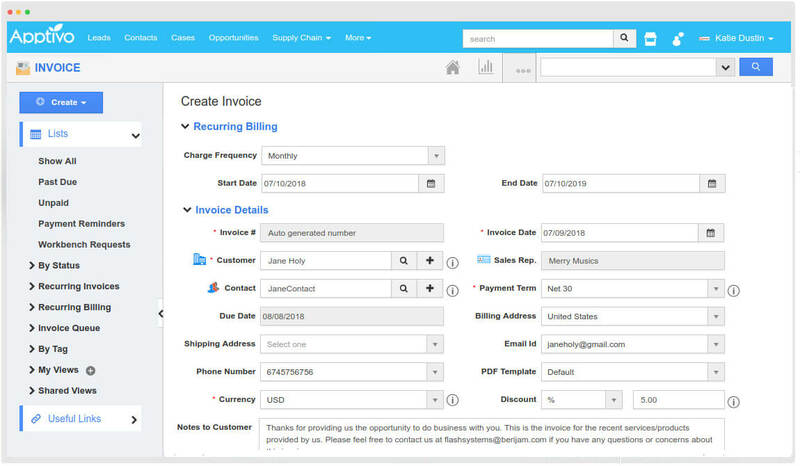 Simply select the invoice frequency and duration and Apptivo handles the rest! 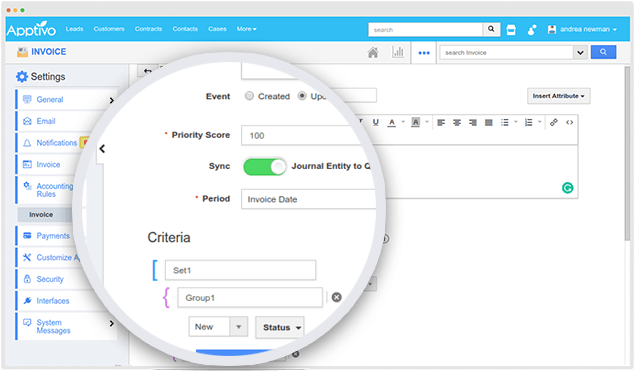 Reduce unpaid invoices and follow up or alert customers by automatically sending reminders to them when an invoice is overdue. Generate commission reports for your employees or run a general report on all the invoices for a selected period of time. A simple drag-and-drop custom invoice template builder to generate professional PDF invoices to send to your customers. 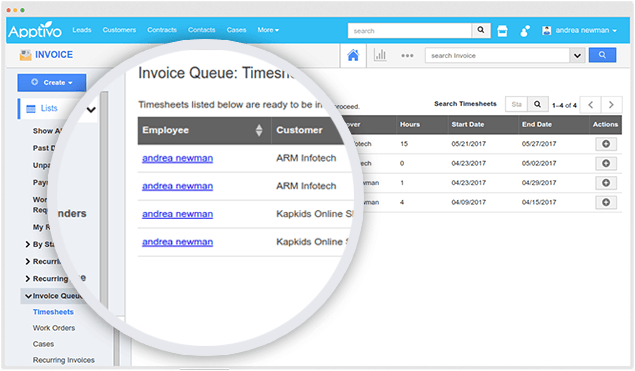 With the Invoice Queue, you can have a speedy perspective of all the approved timesheets, work orders, cases, recurring invoices, and contracts that are ready to be invoiced. 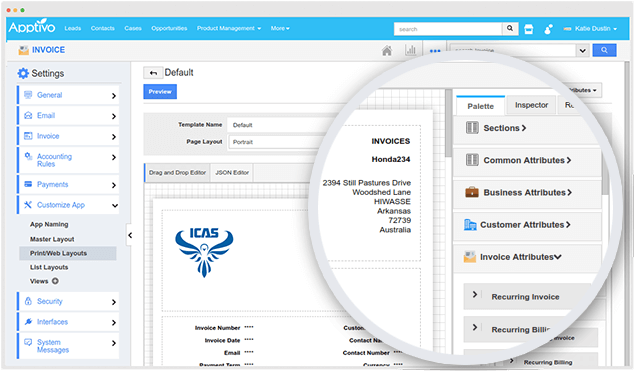 Click on the required record and generate invoices instantly. Design beautiful, aesthetic looking dynamic email templates, to make your email look standardized rather than sending plain text and to effectively communicate with your customers. 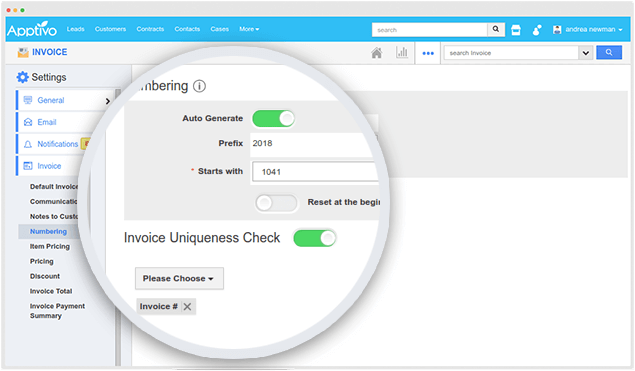 Allow your invoices to be uniquely identified in your business and avoid the redundancy of data. 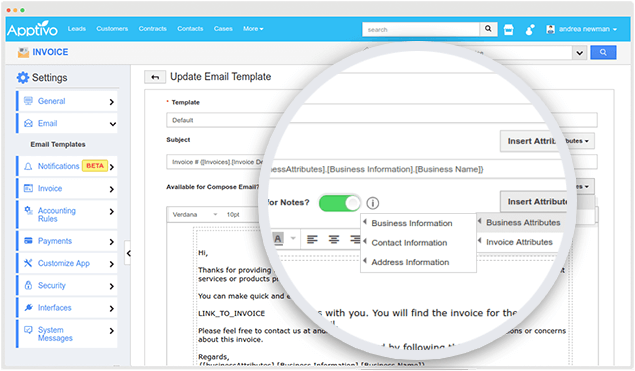 You can specify how an invoice is to be uniquely identified in your business when you are creating an invoice. Connect all your invoices directly to the Apptivo’s Ledger application, instantly. You can have different accounting rules, based on which a journal gets created in the Ledger, automatically. 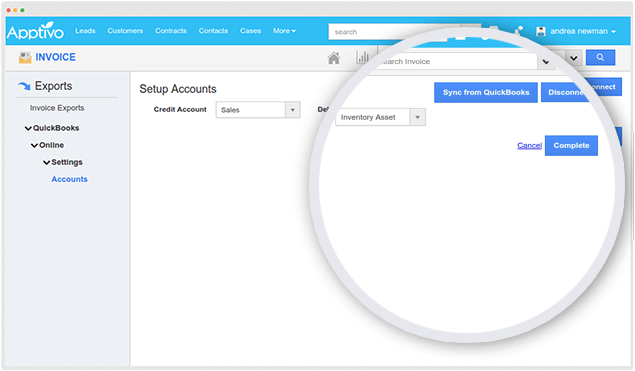 With Apptivo - QuickBooks integration, sync all your transactions (journal records), and make your accounting process simple. Flexibility and customization is the core of what we offer. 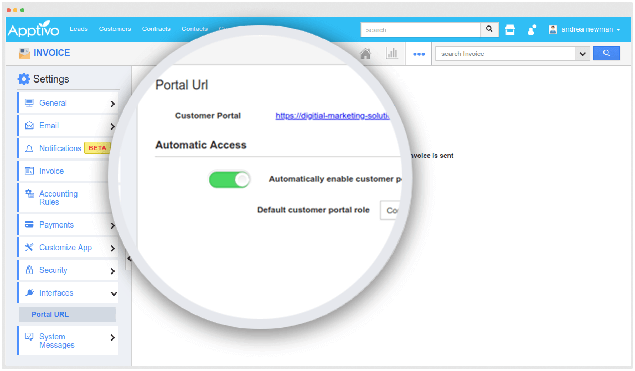 Add any number of custom fields and sections, show/hide the standard fields given, create and save custom views, create reports by saving the search results, and much more. 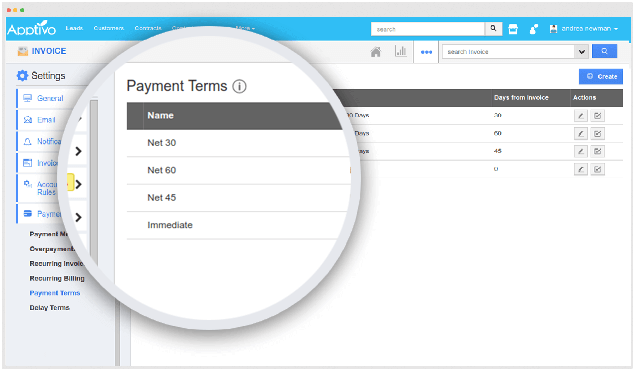 Select one of the default payment terms or create your own payment terms, customizing the customer payment periods specifying your required duration to allow your customers to make their payments. 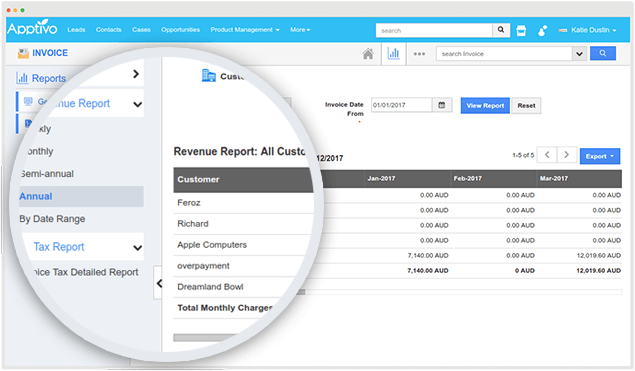 Apptivo provides the ability to share information with your customers, by adding them to specific invoices, so they can login and view their invoice details using their own account. Apptivo provides a FREE 30 Day trial to all its customer to play around with the product and get to know if it suits their business. Apptivo also provides a 1 to 1 demo session to explain how you can use Apptivo for your business.